If the second day of the legislative session is any indication, the rest of session is going to be an exhausting exercise in finding the perfect gif for the madhouse that this is becoming. 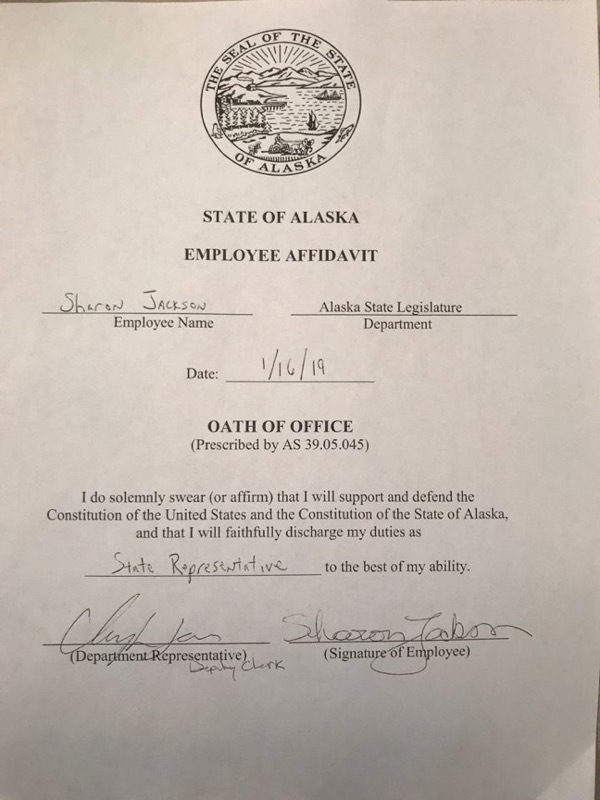 While negotiations were underway to bring some kind of progress to the House, Reps. David “He’s from Willow.” Eastman and Josh Revak took it into their own hands to, well, make things interesting with the notarization of a phony oath of office heard around the 49th state. 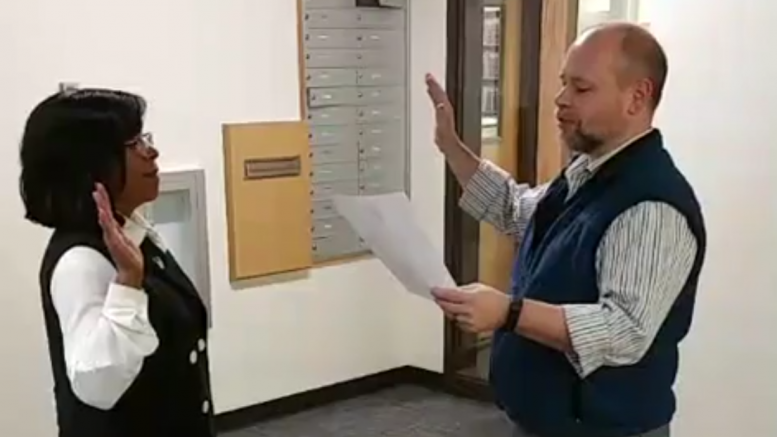 Eastman had apparently found a loophole in the Alaska state law that would allow Rep.-nominee Sharon Jackson to be seated outside of swearing-in process laid out in the Alaska Constitution and state law, so the three bounced over to the court house to have a deputy clerk notarize her pledge of office (here’s the link to the Facebook Live event, courtesy Revak). Boom, take that Rep. Chris “Wants to Follow the Law, Constitution and Legislature’s Uniform Rules” Tuck! Except, surprise, it was all bogus. We reached out to Nancy Meade, the general counsel for the Alaska Court System, to ask for the court’s position on the event. “A court clerk doesn’t have the authority to make anyone a legislator,” she said. Also, for the record, the process for swearing in legislators is laid out in law in AS 24.05.160: “The lieutenant governor shall then direct the administration of the oath of office of each new member.” No mention of deputy clerks in here (also if we really went by AS 09.63.010 then a U.S. postmaster or any notary public off the street could have administered the oath). The whole move took the rest of the House—including some key Republicans, like Rep. Tammie Wilson (the chosen Finance Committee co-chair of the Republican “Majority,” by surprise—and Rep. Dave Talerico, who’s the chosen speaker of the Republican “Majority,” had to release a statement saying even they didn’t think it was a legitimate move. “While the sentiment of this effort to get Ms. Jackson seated quickly is appreciated, the House Republicans anticipate the official swearing-in of Ms. Jackson to take place on the House floor, as in accordance with Alaska Statutes and the Constitution, and we look forward to welcoming her to the body as soon as possible,” he said in the prepared statement. A floor session scheduled for 1 p.m. that had been postponed (probably to an evening meeting time to get to those negotiations, more on that below) was cancelled altogether. It’s an embarrassing stunt for everyone involved, particularly for Jackson who seems frustrated about the state of things and has been looking for a way to get to work. In the video posted by Revak, Jackson was just as happy and excited as anyone who took their official oath on the House floor on Tuesday. Who can blame her? That’s what Eastman and Revak guaranteed. The rules of the Alaska Legislature are complex and confusing, and we’ve seen plenty of newcomers swept under the wing of less-than-scrupulous wing of seem to know what they’re talking about. Next time, get a legal opinion. Those negotiations reportedly had to do with selecting a speaker pro tem, the temporary presiding officer who takes over the gavel from the lieutenant governor so the chamber can elect its permanent presiding officer (a job Sen. Mia Costello John Coghill had for about five minutes in the Senate). The selection of a speaker tem would get the ball rolling for Jackson to be seated, but doesn’t necessarily mean an end to the stalemate in establishing a majority. There’s been no indication that anyone’s budging, and the Eastman-orchestrated stunt certainly threw a wrench into things. The other pressing issue for House legislators at the moment is the matter of staff. As of Wednesday, they technically didn’t have any thanks to the lack of a Rules chair (the person with the authority to assign offices and hire staff). At least part of the negotiations going on Wednesday were to reach a unanimous consensus among the 39 seated legislators to keep their staff while the organization talks are ongoing. While this sort of agreement isn’t explicitly laid out anywhere to our knowledge, it sounds like folks are confident that it’ll work. After submitting his plan to pay back the PFD (over the next three years), Gov. Michael J. Dunleavy held a press conference where the governor handed off most of the questions and answers of his key campaign promise to Department of Revenue Commissioner Bruce Tangeman. The key takeaway from the presser was the explanation for why the payout would have to stretch over a majority of Dunleavy’s term in office: That they just want to make sure eligible Alaskans actually meant it when they promised on their PFD application to stay in Alaska indefinitely (which already raises the specter of Zobel v. Williams for some). They also recognized that nothing in the bill could actually force future legislators to actually abide by the payout scheme, a point that Sen. Bill “If You Want Your Back PFDs in 2019, Then I’ve Got a Bill for You” Wielechowski touched on in his response to the filing on Wednesday. Wielechowski argued that if the money is just sitting in the earnings reserve account, why not put it to use. “Why make Alaskans wait for what is owed to them when the funds continue to sit in this account and are subject to further depletion by the legislature?” he concluded. As for the legislation’s chances in the Senate, we wouldn’t recommend holding your breath. Here’s what Senate President Cathy Giessel told KTOO. The Department of Transportation announced Wednesday that it had apparently found a way to reconfigure the Alaska Marine Highway System so some $27 million in additional upgrades for its new ferries wouldn’t be required. The ferry system, an absolutely critical piece of infrastructure for many communities, was going to have a tough time getting that money from a Legislature that’s expecting some $1.6 billion in cuts from the Dunleavy administration. There were some questions I saw about the viability of the plan described in the department’s announcement, but I’m not familiar enough with the system to vet those claims. Stay tuned. Be the first to comment on "AKLEG Recap Day 2: Swearing-in stunt sidelines House another day"